This is often the first response you’ll hear when explaining that grains are not eaten when following The Paleo Diet. For a few seconds I’m usually speechless – my mind awhirl with so many reasons one should avoid grains altogether. For one – eating more than a couple of tablespoons of bread, including whole wheat bread, will not only cause your blood glucose levels to spike but it will also keep your blood glucose levels elevated for an extended period of time . It’s a vicious chain of events – high blood sugar levels stimulate your pancreas to produce more insulin. Constant high blood glucose and insulin levels (also known as hyperinsulinemia) can be detrimental to your health. Hyperinsulinemia leads to a plethora of problems: inflammation, Cardiovascular Disease, Diabetes Type II, Syndrome X or Metabolic Syndrome, weight gain, infertility, cancer, etc. Google the term ‘Hyperinsulinemia’ along with any one of these health issues and you’ll be surprised by what you’ll learn! To be fit, healthy and happy for the long haul, you’ll need to consistently maintain normal blood glucose levels. That’s one good reason to avoid bread altogether, whether white or whole wheat. Yet when it comes to eating bread, or grains in general, there’s a little more to the story. How would you feel knowing that grains can not only lead to hyperinsulinism, but they can also make your gut leak. Yep, you too may have already acquired “Leaky Gut Syndrome”. 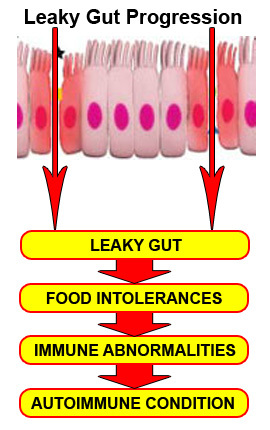 Leaky gut comes in varying degrees from tolerant, to gluten sensitive, to full blown Celiac disease. Not going to give an anatomy lesson here, but think about your mouth, stomach, intestines, etc. from beginning to end. It’s one very long tube. When your intestinal barrier is working correctly, it breaks down nutrients your body needs while keeping out harmful substances. But what happens if this barrier begins to breaks down? You’ll leak – basically leaking the contents of your intestines into your bloodstream. When the microvilli lining of the intestinal wall is destroyed, gate “tight-junctions” loosen and it becomes “open sesame” to bacteria, yeast, viruses and larger food molecules that don’t belong inside your body. Now this is where the fun begins. Your immune system is activated to fight these foreign bodies. A healthy immune system fighting foreign invaders is a usually a good thing. 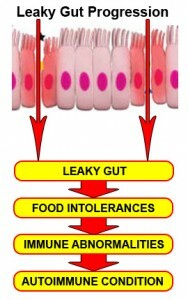 But in the case of leaky gut, your immune system becomes activated 24/7 which leads to chronic systemic inflammation. Not good. Even as far back as 2004, Time Magazine reported in the article “The Secret Killer” the surprising link between chronic inflammation and disease. 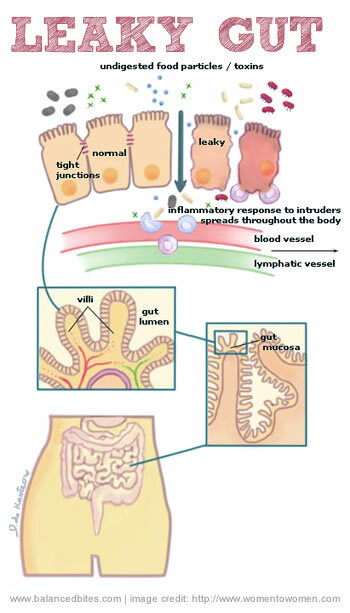 Cerebral Inflammation is involved in Parkinson’s and Alzheimer’s; Arterial Inflammation is involved in Cardiovascular Diseases; Connective TissueInflammation is involved in Carpal Tunnel, Plantar Fasciitis, Rotator Cuff, Bursitis (also known as the “itises”), and Intestinal Inflammation is involved in Irritable Bowel Syndrome, Leaky Gut, Colitis, Crohn’s Disease, etc. Now are you ready to give up grains? If not, read on because believe it or not there’s even more to this story! Drs. Eades state in The Protein Power Lifeplan that Paleopathologists report autoimmune disorders were not seen in the fossil record prior to the onset of the agricultural revolution (cultivation of wheat and maize) some 15,000 years ago. Melissa Smith reports in her book “The Problem with Grains” that the longer people go undiagnosed with celiac disease (and extreme form gut permeability) and continue to consume gluten (remember this is a type of lectin), the greater the likelihood of developing an autoimmune disease. Dr. Wright in “Dangerous Grains” reports that autoimmune liver and thyroid disease, along with rheumatoid arthritis, all occur more frequently in people with gluten (lectin) gut sensitivity than in the general population. And even A. Ventura in 1999 reported in “Grastroenterology” that 77.5 % of the time the diagnosis of an autoimmune disorder is made first before discovering the patient has Celiac Disease. Dr. K. Fine reports at least 50% of the population may be sensitive to gluten. He also states that the genes that seem to make a person susceptible to developing gluten sensitivity are exceedingly common: they’re present in 60 to 70 percent of the population. Dr. Cordain provides extensive evidence to the role lectins may play in gut permeability and the autoimmune response resulting in Rheumatoid Arthritis. He also reports that a reduction in lectin dietary sources can reduce Rheumatoid Arthritis symptoms. There are also many other anti-nutrients found in grains: Alpha-amylase Inhibitors which inhibit digestive enzymes; Protease Inhibitors that inhibit enzymes that break down proteins; Alkylresorcinols that promote inflammation; Phytates which bind to minerals such as iron, calcium and zinc making them unavailable for absorption. Grains can be toxic. Now – must you have your bread? Last, guess what causes leaky gut? That will need to be another blog post, but I’ll give you a hint. As Dr. Cordain explains in his lectures we’ve evolved millions of years on a diet of natural, unprocessed foods – lean meats, vegetables and fruit. But within the last 20,000 years (a speck of time in comparison to 2 million years) most of our diet has consisted of processed modern foods: breads, cereals, rice, pastas, refined sugars, dairy, chemical preservatives and additives, pesticides sprayed on plants, refined vegetable oils, alcohol, numerous prescription and over the counter drugs, etc. Hmmmmm….Neolithic Foods, possibly another smoking gun? Now you may understand why my mind begins to whirl when someone declares they’re not going to give up their bread! special thanks to Karen Brimeyer of http://www.leakygutcure.com/ for the use of her images! I wanted to see if it would be okay for me to use one of you Leaky Gut pictures as a poster? I don’t want to take your material but it looks very good. If I could, do you have a higher resolution copy of that picture? 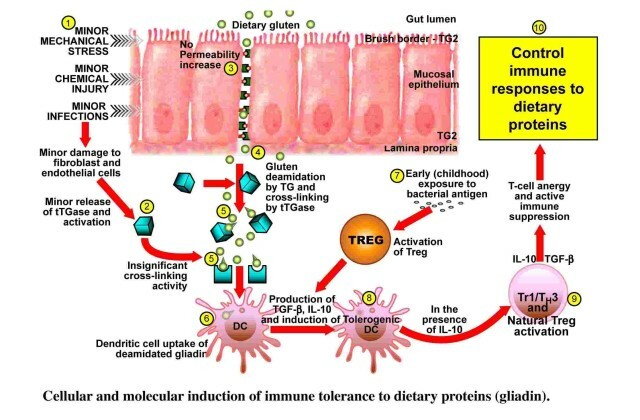 It is the top image under Got Leaky Gut.